Amazon Chime provides you with the ability to view detailed reporting information about your account or for a single user's activity. This data gives you visibility into how your users are using Amazon Chime and gives you information about their experience. 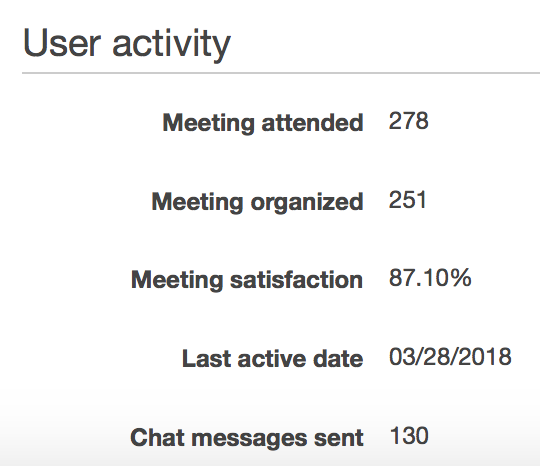 You can see up to 12 weeks of data such as the number of registered users, how many were active during the period, the number of meetings that were held, the percentage of positive meeting feedback responses and the number of chat messages posted. View reporting data by navigating to the Amazon Chime admin console, selecting your Amazon Chime account and choosing Dashboard. Date range (UTC) – The date range of the report (Monday - Sunday). The date range is displayed in UTC time zone. Registered users – The total number of users that have registered and signed into an Amazon Chime client to date as of the end of the date range. Note that once a user is suspended they will no longer be counted as a registered user. Active users – The number of registered users who either attended at least one meeting or sent at least one message with Amazon Chime during the date range. Meetings held – the total number of meetings that occurred during the date range. Note that the metrics use meeting end date and time to determine the period in which it is counted. Meetings media satisfaction – The percentage of positive responses (thumbs up) given to the end-of-meeting survey for meetings that ended during the date range. Meeting feedback requests are presented to attendees who join using an Amazon Chime client. Chat messages – The number of chat messages that all users have sent during the date range. This includes messages sent in 1:1 and group conversations, in chat rooms and in meeting chat. Note: Report data is updated daily and may be delayed due to processing. From the Dashboard report, click on the link displayed in the Meetings held column to see a list of all meetings that occurred during the date range. Choose any of the highlighted numbers to drill down into the details such as the duration, number of attendees and meeting events or choose a Meeting Organizer to quickly navigate to that user's all time activity summary including meetings held and feedback. Choose a conference ID to get events that occurred during the meeting listed by attendee. Meeting start (UTC) - UTC date and time that the first attendee joined the meeting. Duration (HH:MM) - Total time between start and meeting end. Meeting attended - the total number of meetings they have attended. Last active date - date of the last time they attended a meeting or sent a chat message. Chat messages sent - total messages posted to 1:1, group conversations, chat rooms and meeting chat. To view a user's activity, navigate to the Users list in the Admin console, find the user in the list of users and chose their name or navigate from the Report dashboard. The “ListAccountUsageReportData” action to grant IT administrators access to the Dashboard page. The “GetUserActivityReportData” action to grant IT administrators access to view the summary of user activity on the User details page. The “GetMeetingDetail” action to grant IT administrators access to drill down and view attendee, connection and other details for a meeting. The “ListMeetingEvents” action to grant IT administrators access to drill down and view all events that occurred for a meeting from the Dashboard. The “ListMeetingReportData” action to grant IT administrators to drill down and view meetings that ended during the date range from the Dashboard.